I recently made up a number of terrain features to add to my games. 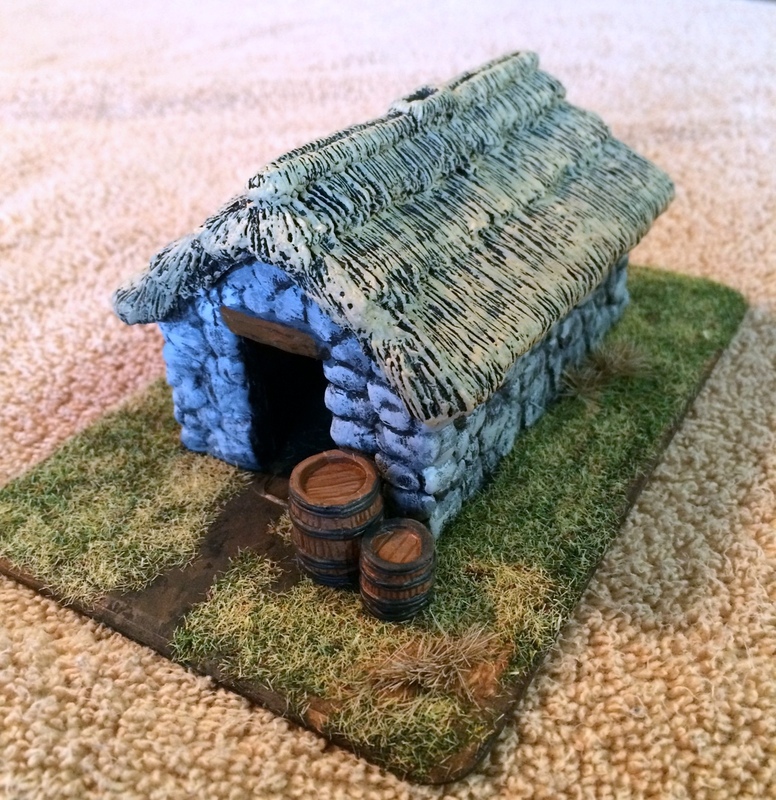 I find it so much more satisfying to have some nice-looking terrain pieces in a game, and they are fun to make. First up are two small pieces of broken or rough terrain. These are both roughly 6″ by 3″ and are based on thin sheets of plywood which have been cut to shape and sanded down. 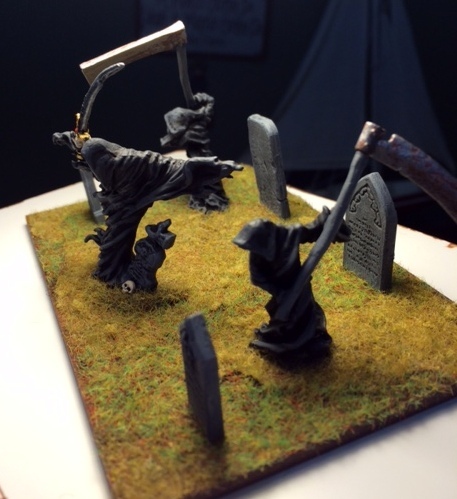 One of the pieces has a small pool of water made with Woodland Scenics Realistic Water. The rocks and wood were found in a field and I just left them their natural colors. 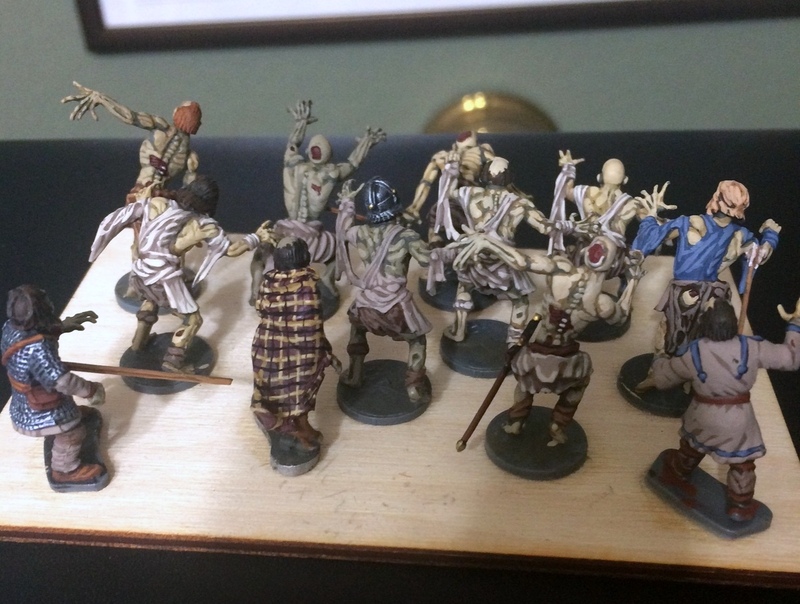 I posed some 28mm figures next to them to give them some scale, but you could easily use this for any other scale. Next up is a small pond made the same way, using the Woodland Scenics water. I’ve found that it looks best when you pour 2 or 3 layers on it, but you have to be patient because each layer takes many hours to dry. I really went nuts with this stuff, creating a bunch of river sections and going through nearly the entire bottle. The river is not quite finished yet, so I’ll include some photos in a later post. Next are some farm fields. I made all of these using a hot glue gun to lay down the rows, then covered the entire field with a layer of sand. The enclosed field with a stone border was made by gluing pebbles together. The one with the wattle fence came from Renedra. Next up is the forest. I don’t know about you, but when I see a piece of felt on the table with three trees on it, I have a hard time imagining that it represents a forest. I wanted to have something that indicated the density of forest while still allowing the players to easily move their units through it. Here’s what I came up with. First, I created the base of the forest. This is a large piece of thin plywood that was 12″ x 12″ and then cut to shape and sanded. On this, I put a layer of flocking (red flocking to represent dead leaves, then a layer of forest debris and underbrush). I was careful to make the flocking relatively light on the areas where the trees would be so as not to impede their placement. Around these areas I put some thicker brush, rocks, and fallen logs. When the stands of trees are placed, this debris will act as a kind of border and will (hopefully) add to the sense of density for the forest. The trees were made with wooden dowels of various thickness, over which I made the “bark” with the hot glue gun, and then attached clumps of foliage from Woodland Scenics. The trees were then attached to four stands. 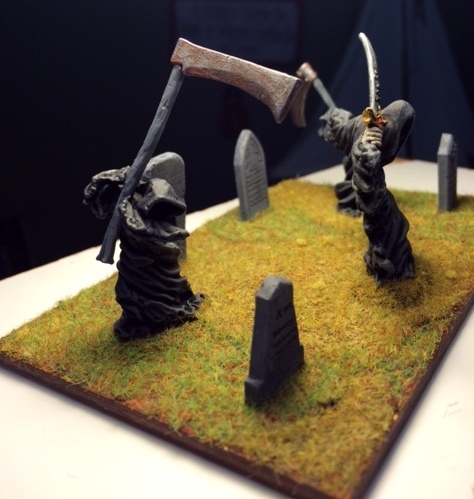 Two of the stands were roughly 6″ x 6″ and the other two were about half that. The large stands got 6 trees each and the smaller ones got 3. 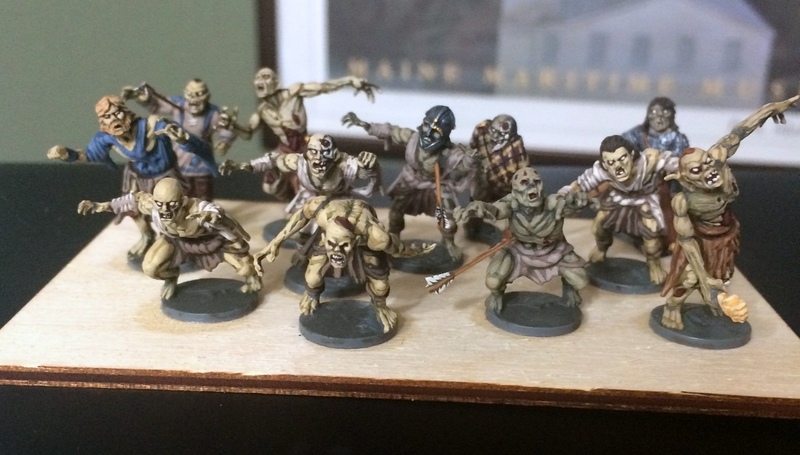 The stands, in turn, got the same underbrush treatment as the base. The result of this is that you can set the forest base down and set the tree stands on them. When troops move through, you simply remove tree stands. 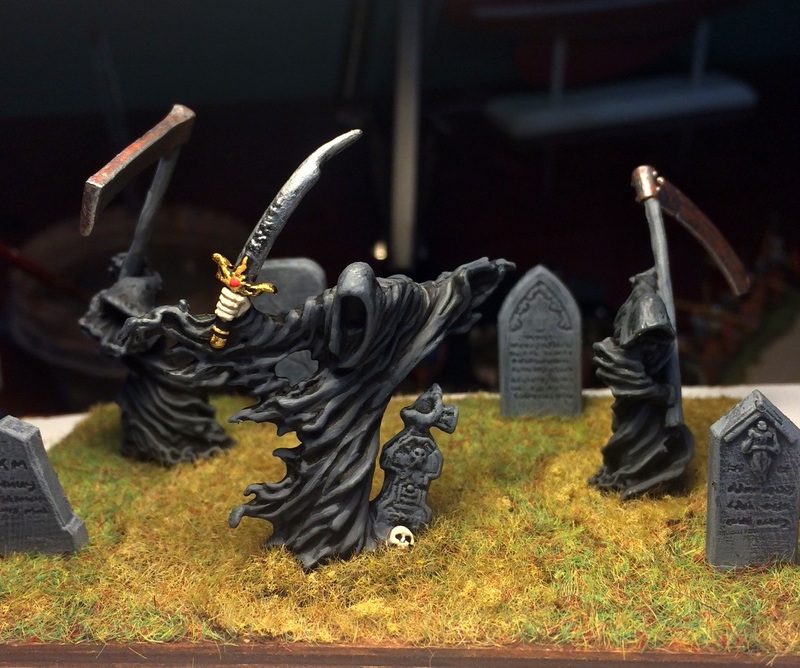 They also make nice scatter terrain on their own. I’m thinking of making at least 4 of these forest sections so that I cover a fairly large area. And last but not least, I have a herd of cattle, which is not really terrain, of course, but is a part of the landscape. 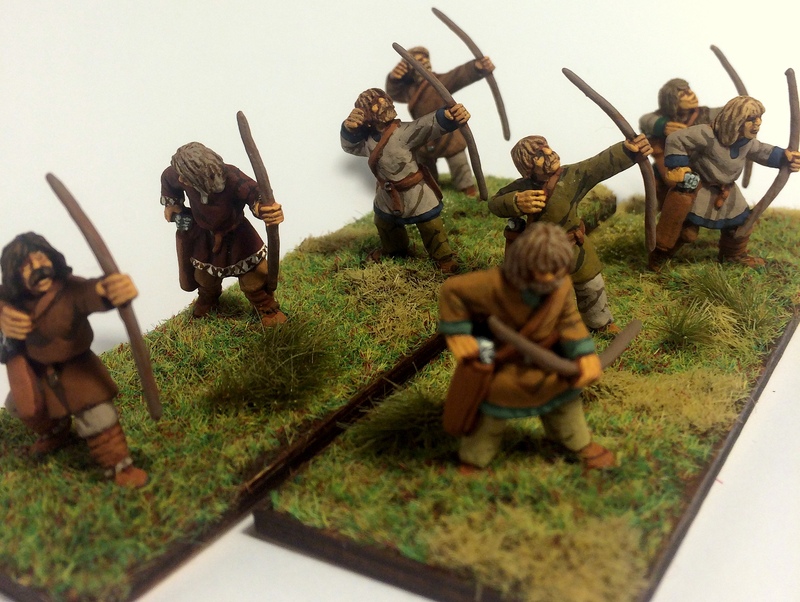 I plan to use these for cattle raid scenarios as objectives. 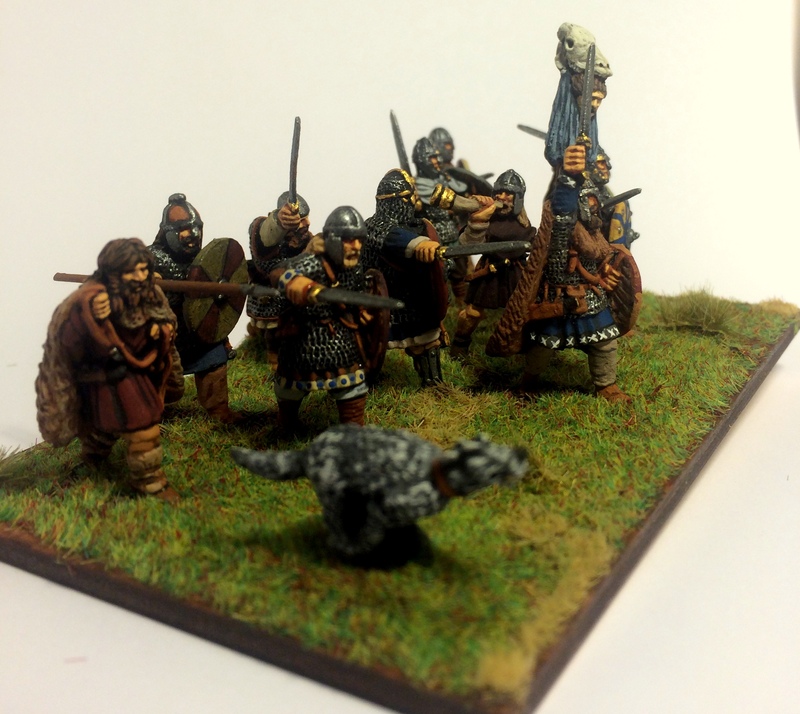 The cattle and herdsman are all from Gripping Beast. 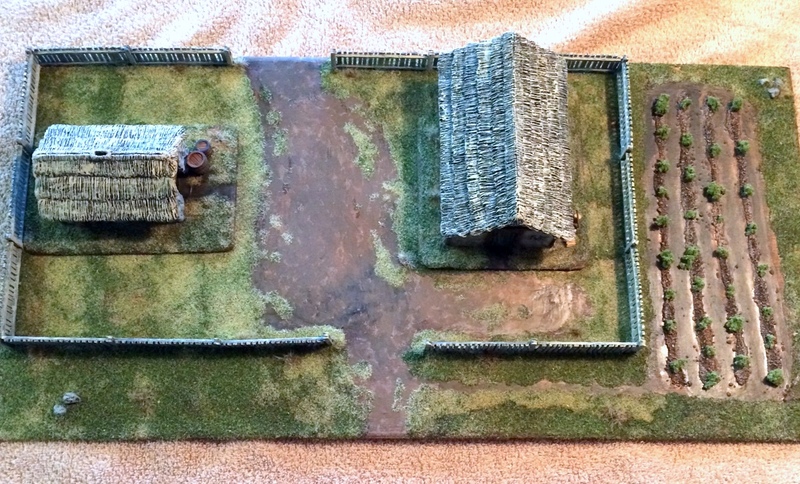 To go along with my growing Dark Age forces, I decided to make a “town” terrain feature for the boys to fight over. But I thought that if I made it look like a small section of a full-sized town, it would just look too unrealistic. Towns are big, sprawling things and you’d need at least a full table for it to make sense visually. 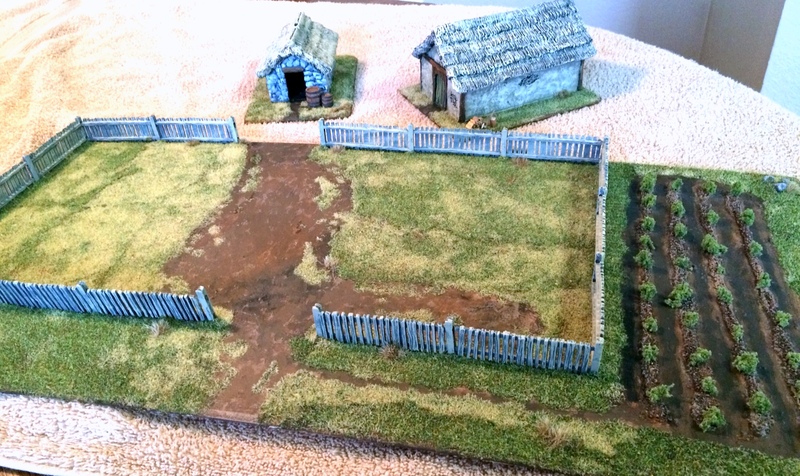 But I thought a single homestead would make more sense on the table and still convey that this is “urban” terrain. I consider this a kind of first draft of a terrain piece. 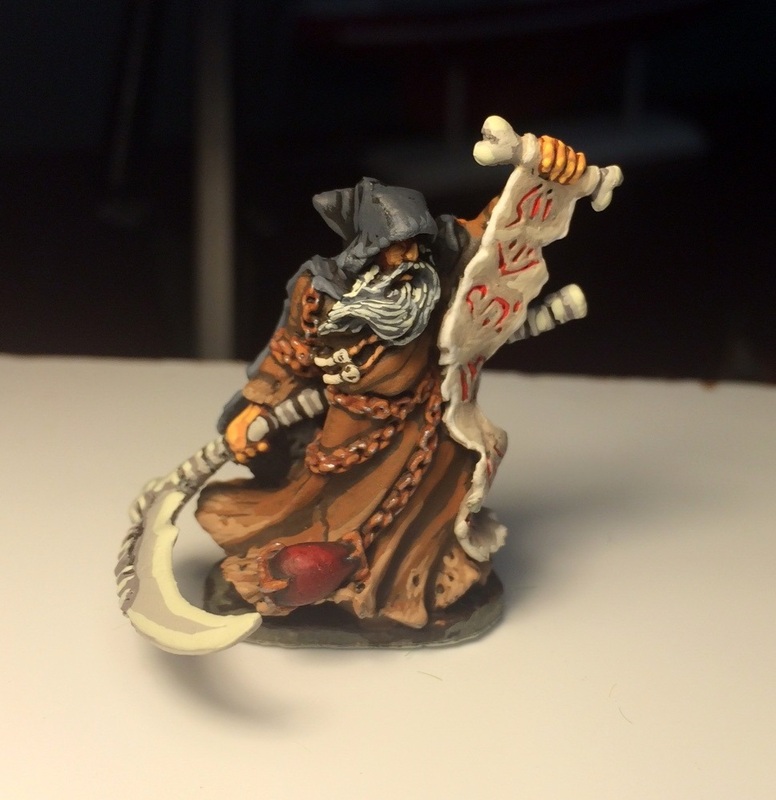 I’m looking at it and seeing things I’d like to improve. So, I still may make some changes or additions to it. I started with a piece of thin plywood that measured 24″ x 12″, and I sanded down the edges so they wouldn’t appear so obvious when set up on the table. I glued down the outer wall, which is made from two packs of Renendra picket fences. 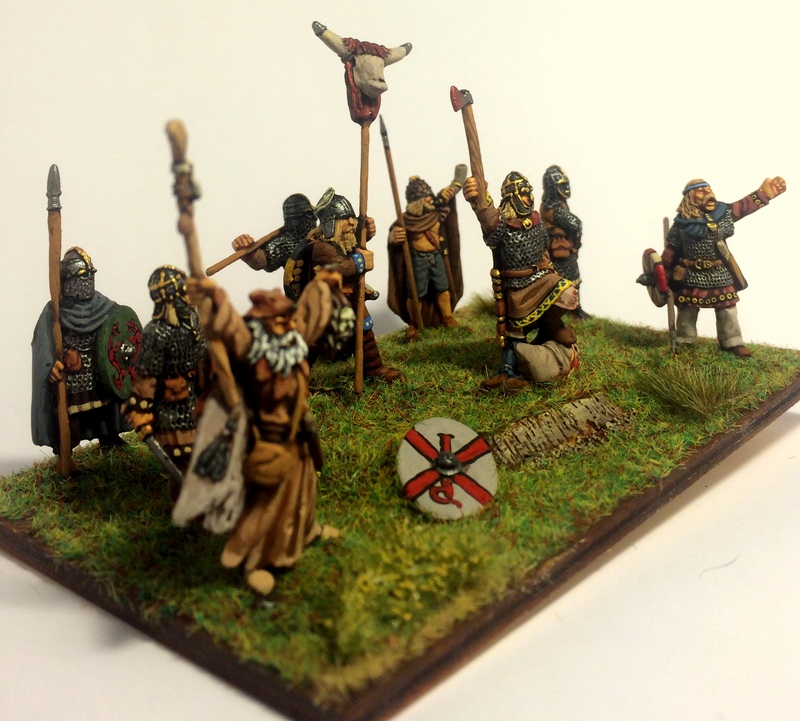 I tried to set it up in such a way that I could comfortably place my infantry units along the edges to defend it. 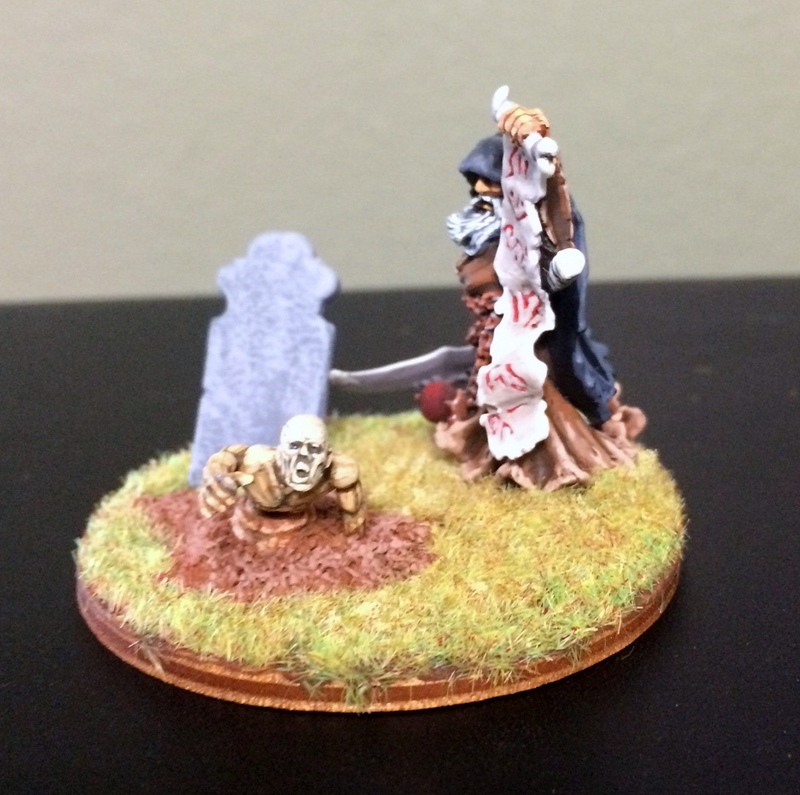 Then I painted it and added ground cover. 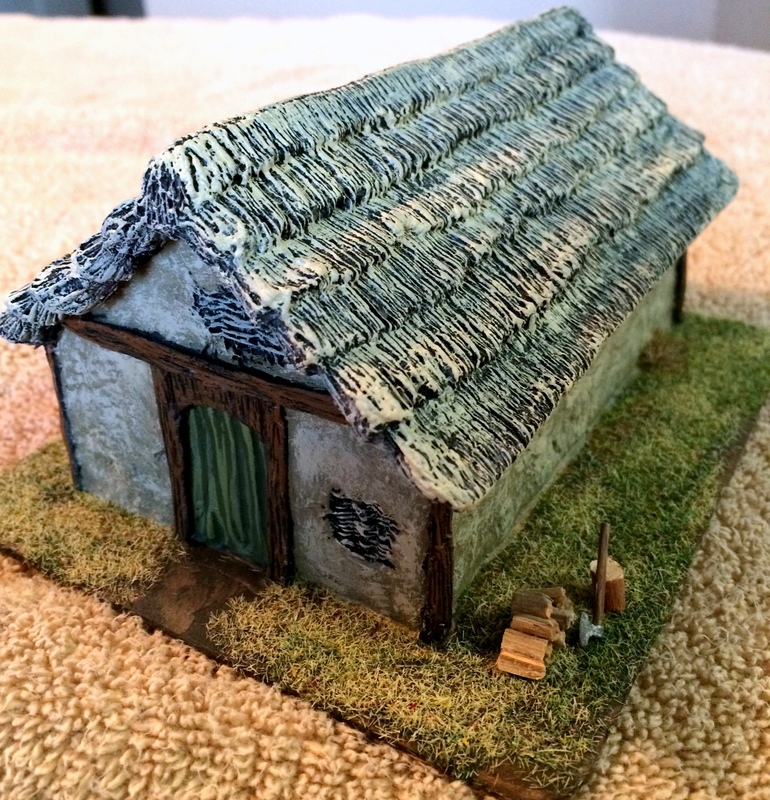 The two structures are resin dark age buildings by Gripping Beast. I placed them both on their own bases so that I can remove them when troops occupy the terrain feature. 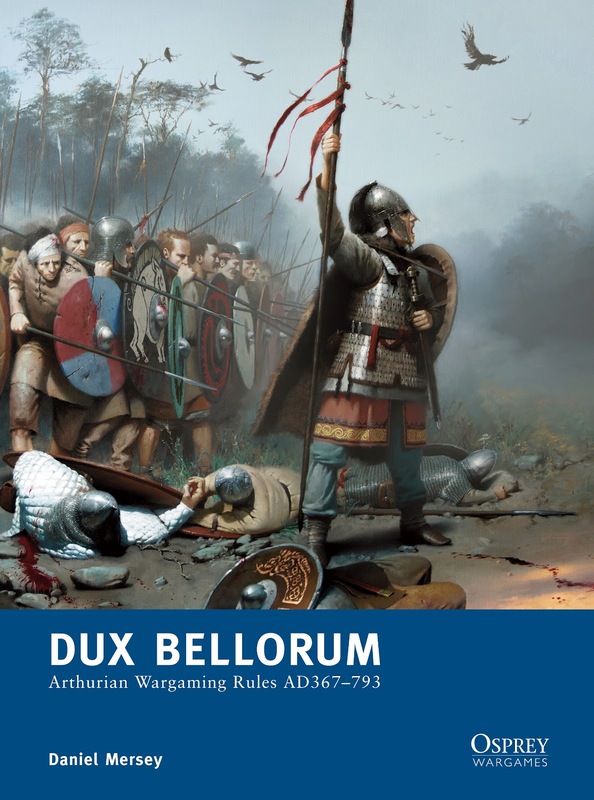 My friend Francisco and I have been playing Dux Bellorum about once a month, and we recently tried the scenario “The Bard’s Tale”. 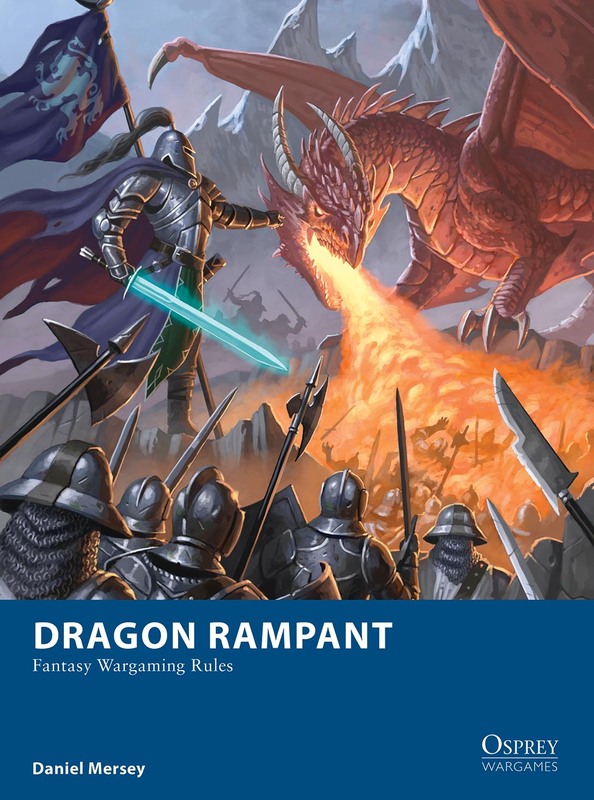 If you’re unfamiliar with the rules, this scenario is pretty standard except that both sides have a bard with their army, and victory is determined by the glorious acts of heroism he witnesses. Think of the bard as the Dark Age equivalent of an imbedded reporter, bearing witness to the battle for the benefit of the folks back home. Forget all the usual things about winning and losing a battle, they don’t matter here. All that matters is how much (or how little) glory the bard witnesses. In the scenario, each player attaches his bard to a unit at the beginning of each turn. While he is attached, the player gains points for whatever happens to the unit, both good and bad. Think about that for a second, because it dramatically alters the way the game is played. Even if the unit is wiped out you get points, and the more spectacular the battle the more points. 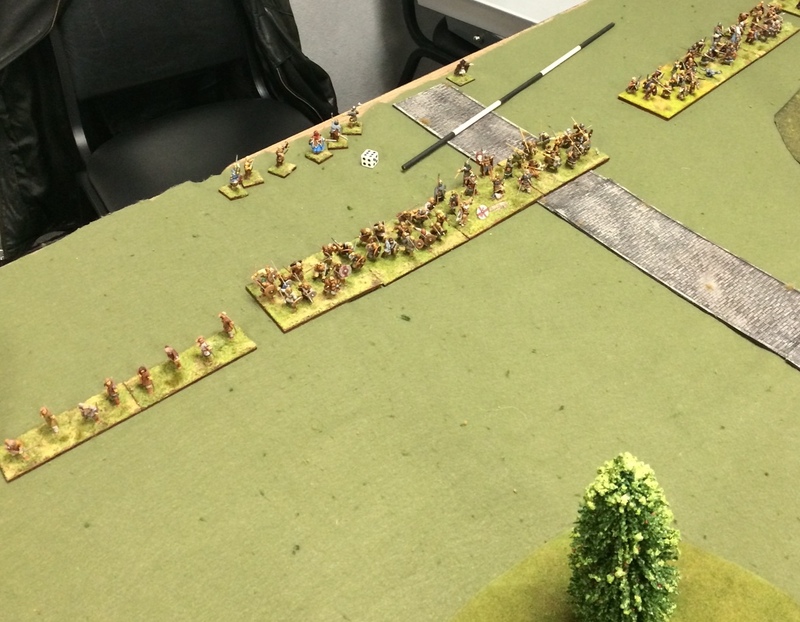 He also chose the “Imposing Horses” strategy for his force, giving his cavalry an attack modifier when charging. The terrain was nothing special, just a small patch of woods on the left and the right with an old Roman road running down the center. 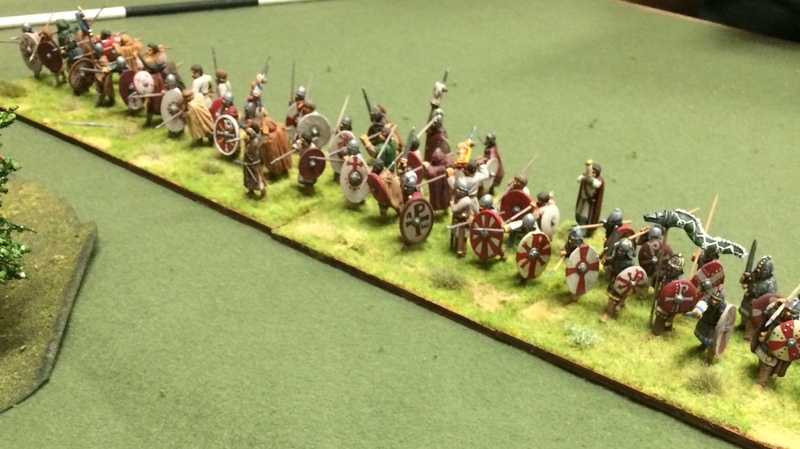 The Romano-British started the game by slowly moving both flanks forward. 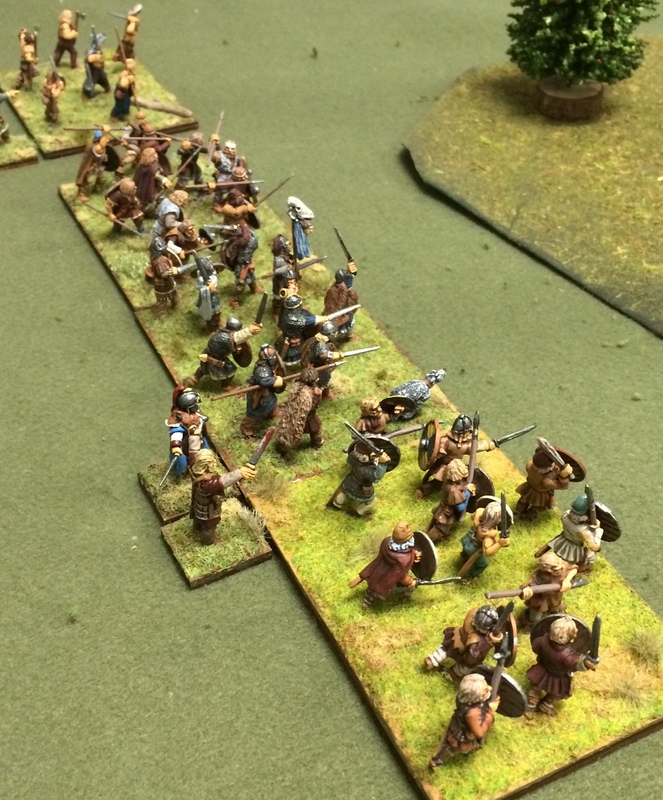 The Saxons responded by moving their left flank, including the fanatics, forward into the woods directly in front of them while the skirmishers on the right headed for the other patch of woods. 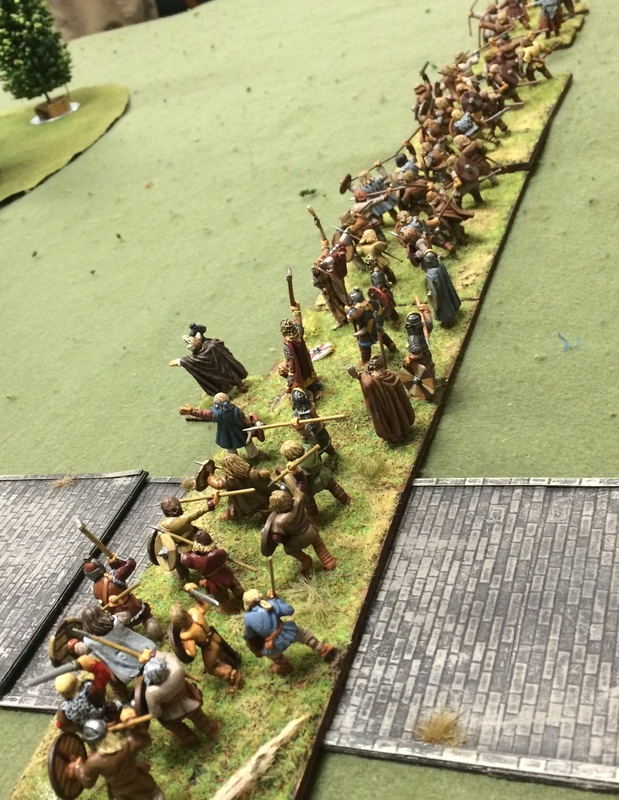 As the lines came closer, the fanatics on the Saxon left charged out of the woods at the nearest British unit with bloody results. 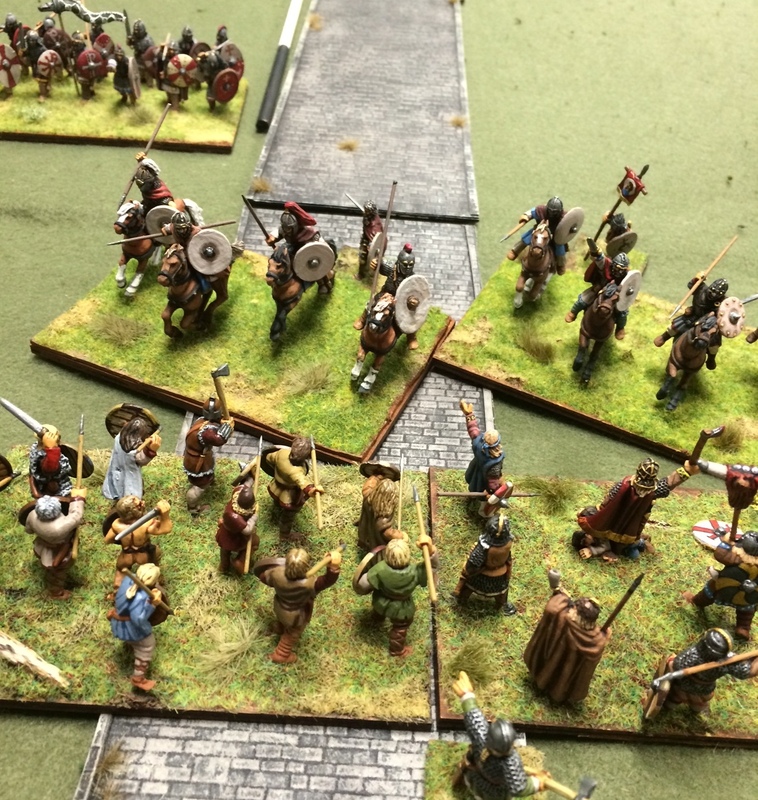 The fanatics were wiped out, but the fury of their assault inflicted casualties on the shieldwall, weakening it. This was where I made my first bard-related mistake. 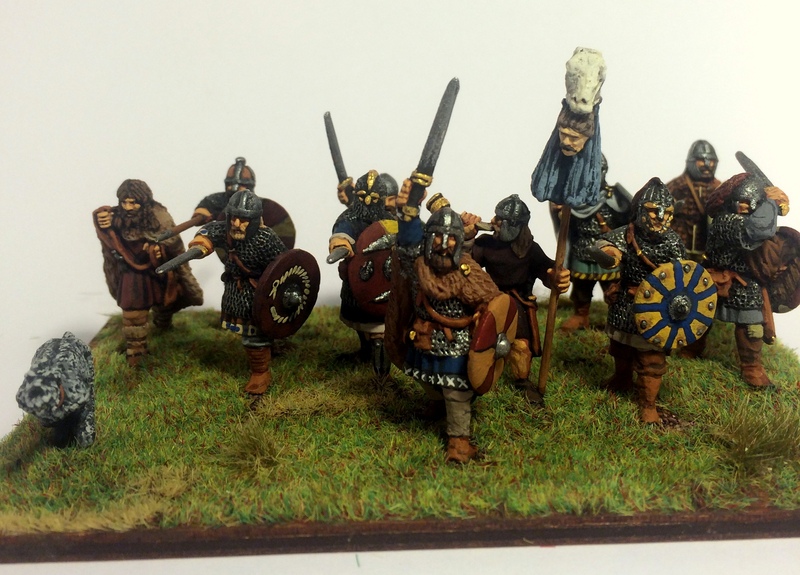 Instead of placing him with the fanatics where he could witness the glorious charge, I placed him with one of the warrior units that I thought would be in combat. I was wrong. No points awarded. 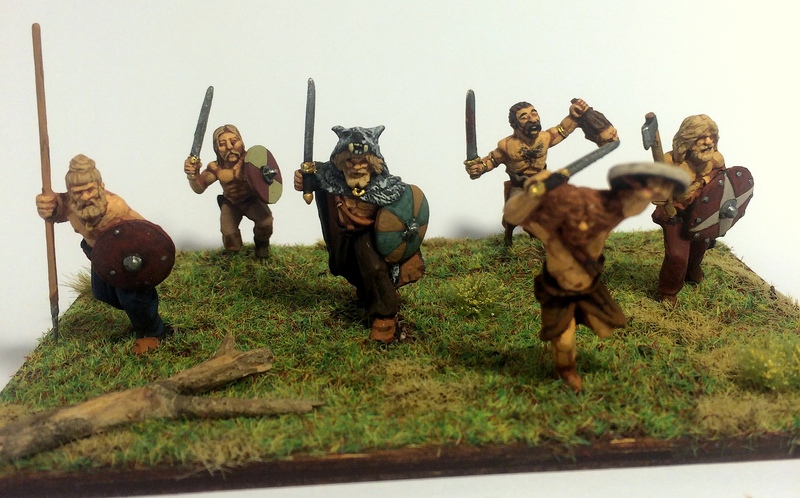 The fanatics charge out of the forest. 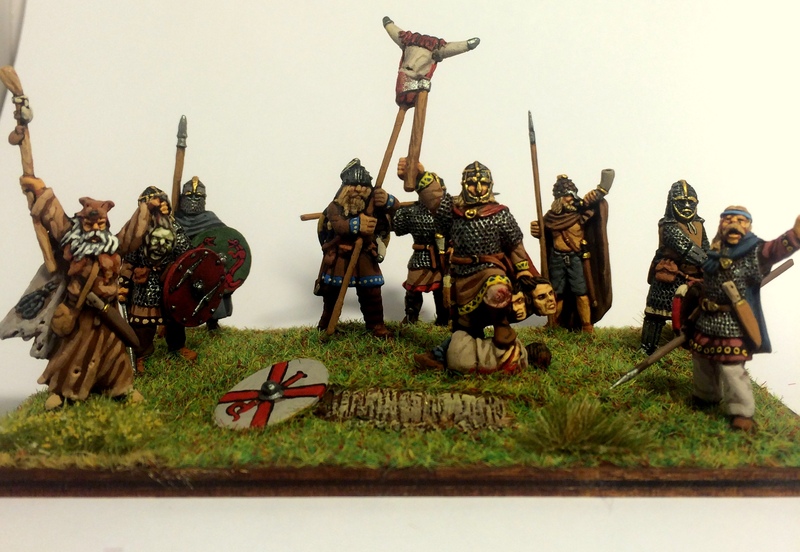 By the way, in the photo you see, the individual command figures on small square bases represent “Leadership Points”, which gives the unit certain benefits in combat. 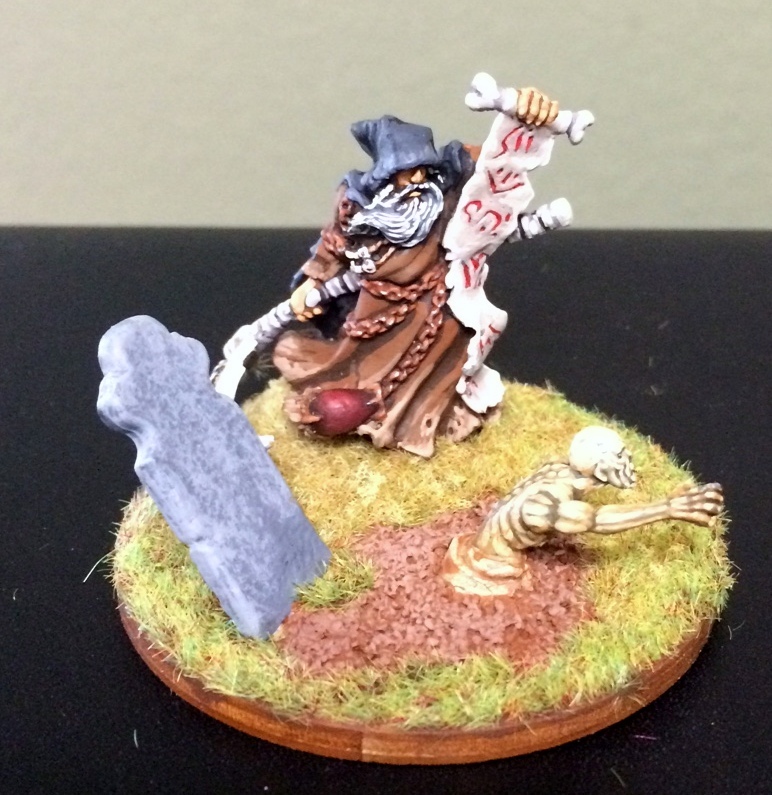 The bards are also on square bases. Wherever you see casualties on round bases, these represent cohesion losses. 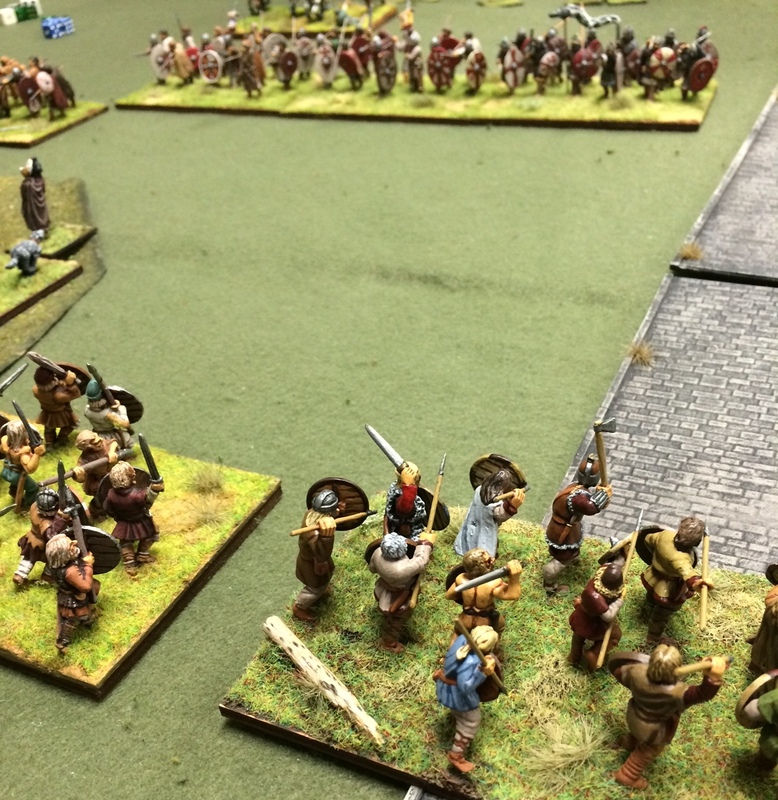 At the same time that the fanatics were making their heroic but unwitnessed charge, the British cavalry at the other end of the line charged forward and smashed into the Saxon line. 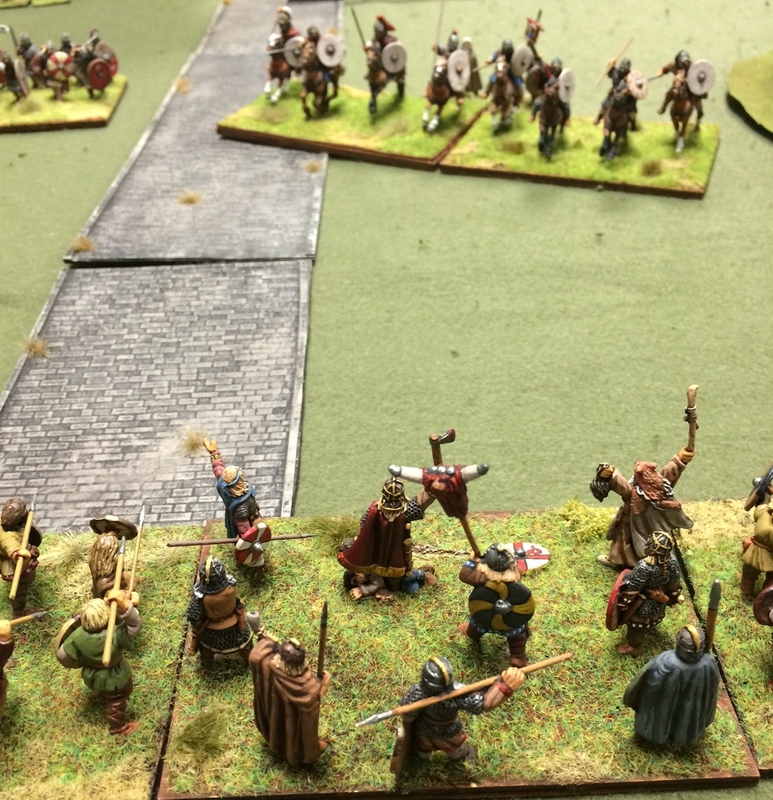 The cavalry certainly put a dent in the line of Saxon warriors, but were mauled in the process, taking many casualties before falling back. It’s good to note here that cavalry of this period, although powerful, were not the panzer-like monsters that later knights would be. In this period, the mostly threw javelins rather than charging home. 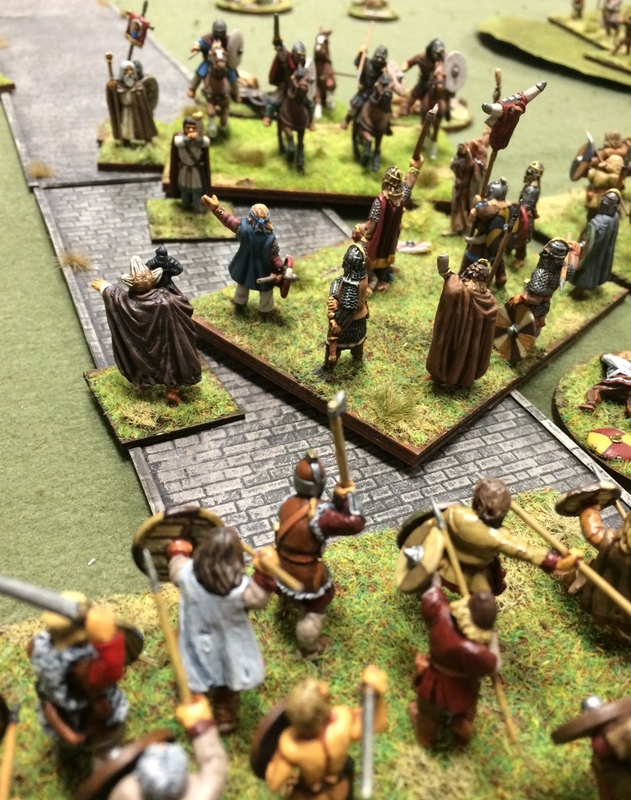 The push and pull of battle began to break apart the lines into a series of fights between individual units. Francisco and I started to get the hang of putting the bard where the action was going to be. 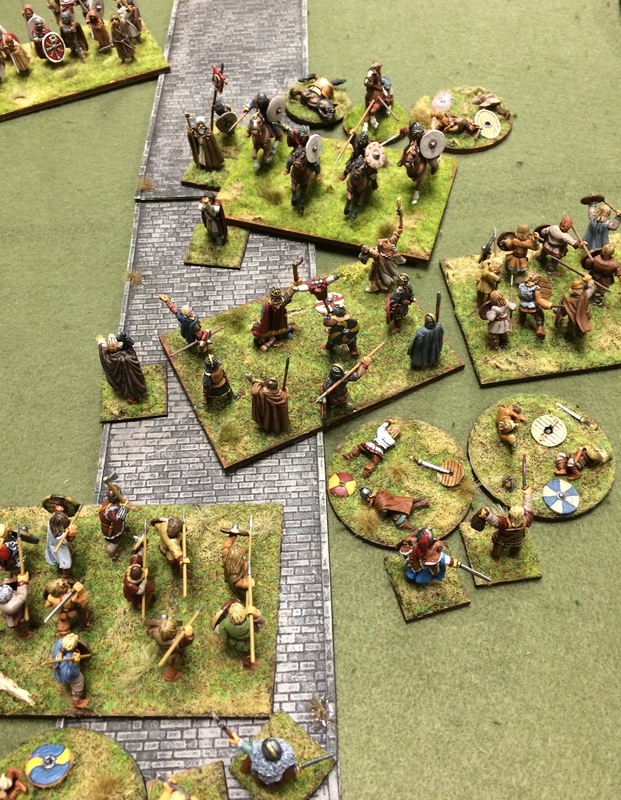 As units began to crumble and rout off the table, we both racked up a lot of bard points. 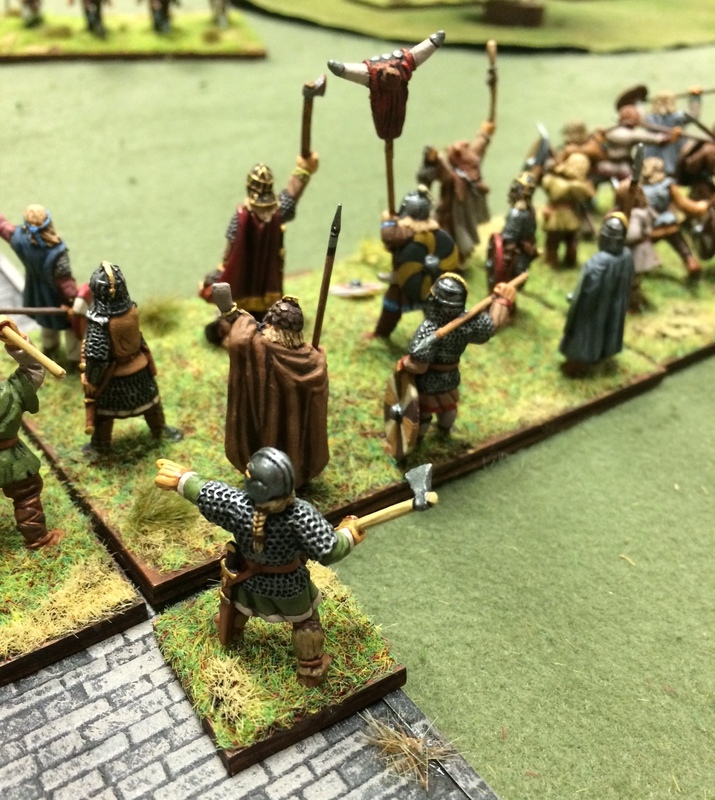 The Saxon king and companions was pummeled by repeated charges back and forth. One more cohesion loss would destroy the unit. 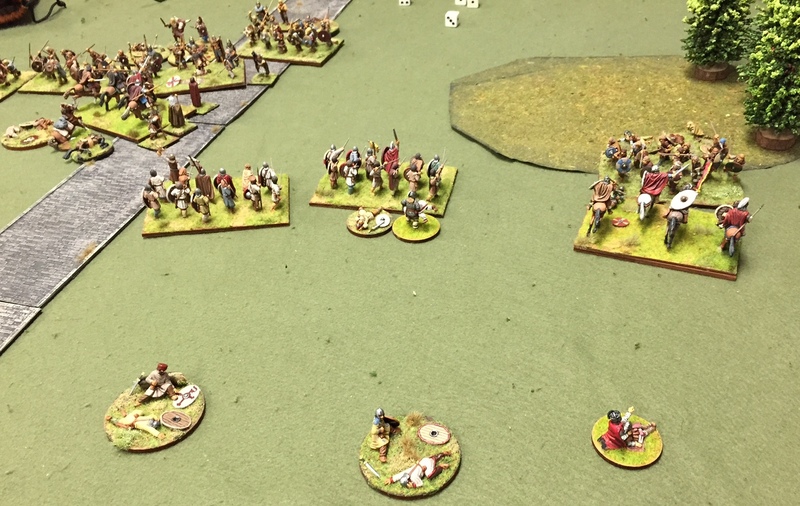 British units now began to back away, not wanting to add victory points. 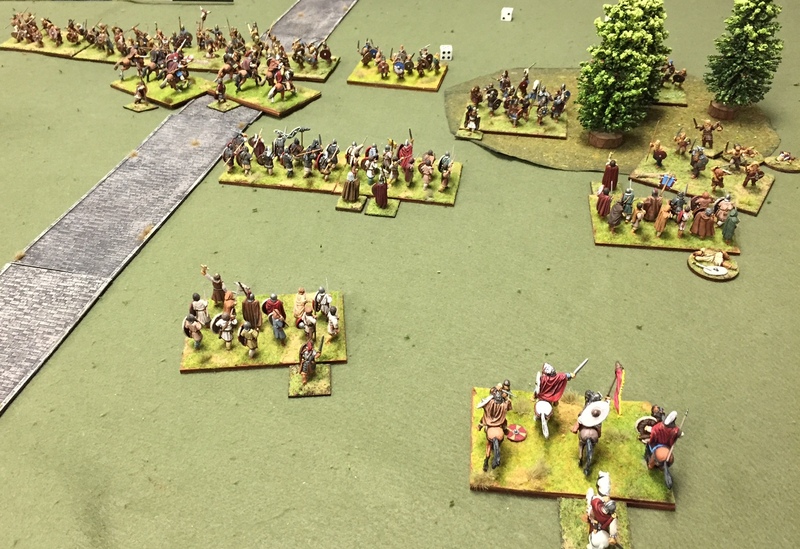 The Saxon skirmishers who had been shooting into the British left flank, now fell silent less they kill off the remaining British cavalry (Archery adds nothing to bard points since there’s no glory in it). 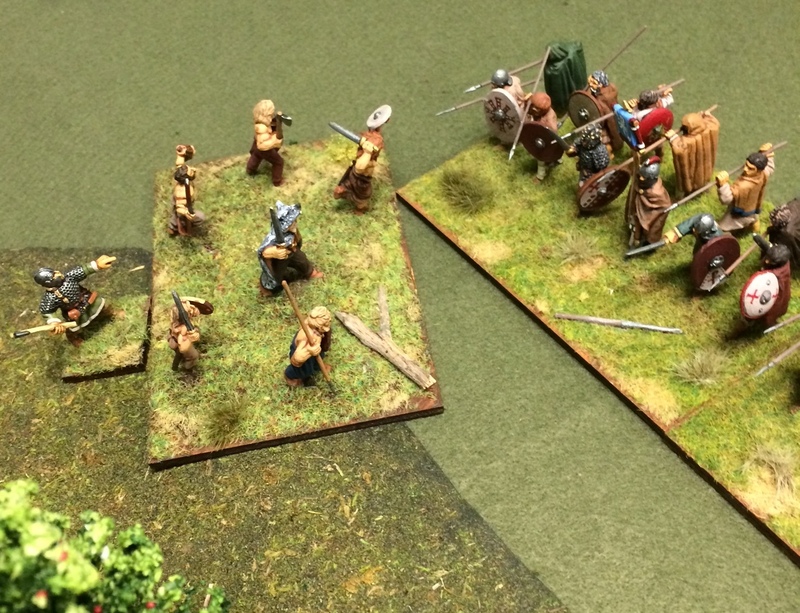 Finally, the Saxon king managed to charge forward in one last, glorious, bloody charge attended by the Saxon Bard. He was killed in the process, but managed to take out another British unit. 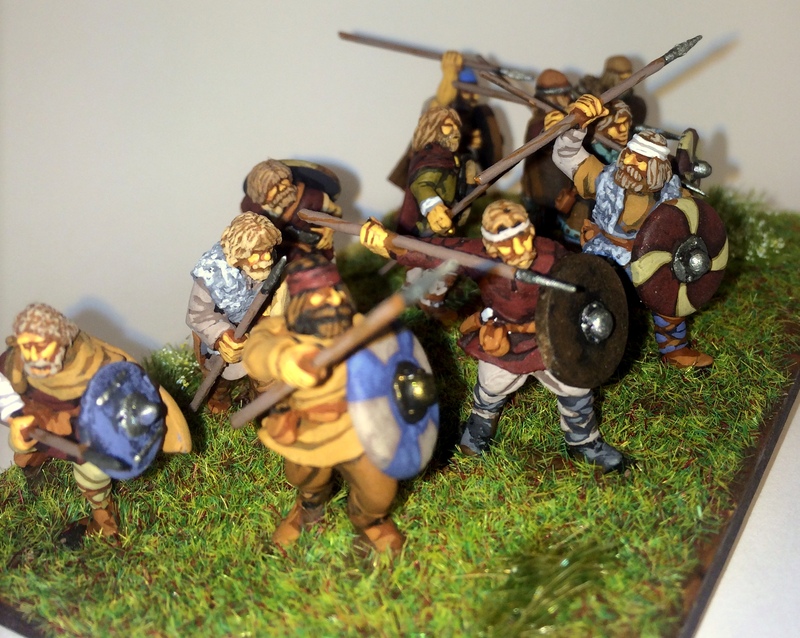 The rest of the Saxon line surged forward, causing even more losses among their foes. 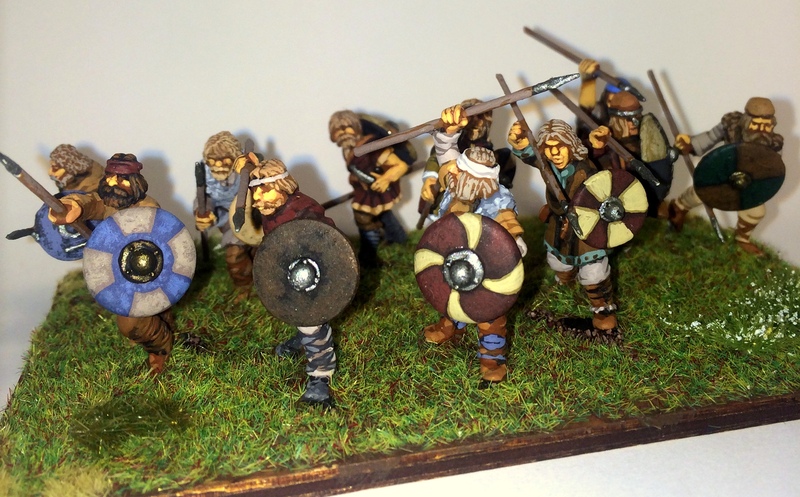 With so many dead, both armies now had to check morale and it was the British that broke, leaving the field to the surviving Saxons. However, we counted the points and found that the British had far more than the Saxons. In a finale reminiscent of the Welsh poem “Y Gododdin”, their bard came away with a tale of glory mixed with tragedy.